Also the mango trees grown from cuttings produce a week root system, that is why the mango trees are mostly propagated from seeds, air layering, budding and grafting methods . However, you can try rooting a mango tree from stem cuttings, if the tree is not producing fruit. 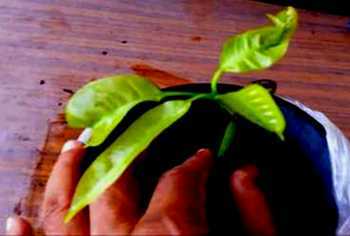 Can a mango tree be propagated from cuttings? 1. Age of the tree from which the cuttings are taken : The mango cuttings from both young and mature trees can be taken, the success rate however varies. Under certain conditions, the cuttings from mature trees work better than cuttings of young tree. I tried the propagate a polyembryonic mango tree from young tree. 2. The position of the cuttings on the tree : The rooting of mango cuttings is dependent on the position on the tree from where the cutting is taken. The cuttings taken from the base of the mango plants are rooted better than those collected from other places . 3. The type of cutting : Both semi-hardwood and young seedling cuttings have been propagated. Rooting of the short cuttings is more satisfactory than that of the long cuttings. 4. Rooting media : The rooting media should be free-draining. You can mix peat moss or sphagnum moss and sand in equal amount. 4. The time of cutting : The propagation rate is high in summer, however, it can be performed in winter under controlled conditions. 5. The environmental conditions under which the cuttings are rooted. Purdue University Horticulture experts advise that cuttings from mature trees work better than cuttings of young trees, although they still only have a 40 percent success rate. In an experiment, semi-hardwood cuttings with 4 – 6 leaves were taken, rooting hormone IBA (3-indolebutyric acid) or NAA (naphthalene acetic acid) was applied at the cutting ends and put in the rooting media. Maintaining high humidity around the rooting zone and applying bottom heat of 25° to 30°C resulted in 75 to 100% success rate for the cuttings taken from young seedlings and from 0 to 100% for cuttings taken from grafted plants . The success rate without applying heat was much lower. The bottom heat can be provided by using heating mats or by means of soil warming cables. A thermostat can be used to control and maintain the temperature automatically. Hard wood cuttings from mature mango trees do not root by normal methods. However, hard wood cuttings from ringed shoots of mature trees have been found to root successfully with 80% success rate under intermittent mist [5, 6]. Making a 2 cm long vertical cut at the base of the cuttings using pruning scissors can improve success of rooting of the cuttings. roots and total length of roots increased compared to the treatment with hormone alone . covering the soil with a transparent polyethylene and exposed to sun for 2-3 months. Take thin cuttings about 8 inch long from a healthy and young mango tree. Take some bottled water in a cup and add a pinch of rooting hormone in it. Dip the lower cutting ends in this solution for 8 to 10 days, changing water every 2-3 days. Plant these cuttings in free-draining soil. Mix potting mix with coarse river sand in equal amount and fill in a small pot with several drainage holes at its bottom. Water well the soil.Mix to ensure that the soil is wet at all points. Plant the cuttings in the soil and seal the pot in a polyethylene bag to maintained high humidity. Place the pot in a warm place away from direct sun. I put the pot in sun but the cuttings were protected from sun by shadowing them. The success rate was about 25 percent. 5. Basu, R.N., Ghosh, B., Datta, P. and Sen, P.K., ROOTING IN CUTTINGS OF MANGIFERA INDICA, L. Acta Hortic. 24, 61-63, DOI: 10.17660/ActaHortic.24.8 (1972).